On 6th December 1915 The Pals left their training ground at Fovant and sailed from Liverpool, arriving in Egypt on 21 December. Outpost duties at Kantara ended in February 1916 when they sailed from Port Said for Marseilles. 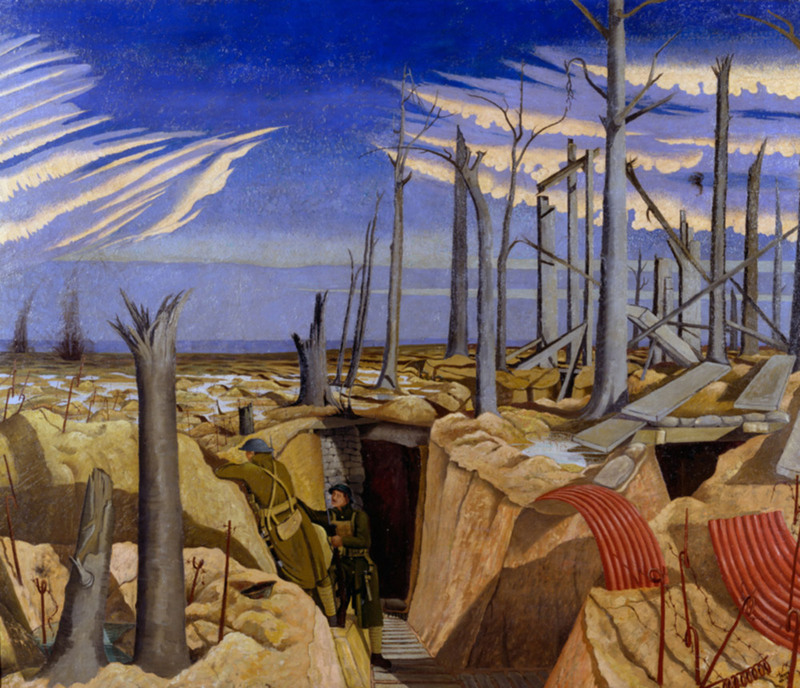 Oppy Wood, 1917, Evening by John Nash. This image was chosen by Ralph Hudson for the cover of his book The Bradford Pals. 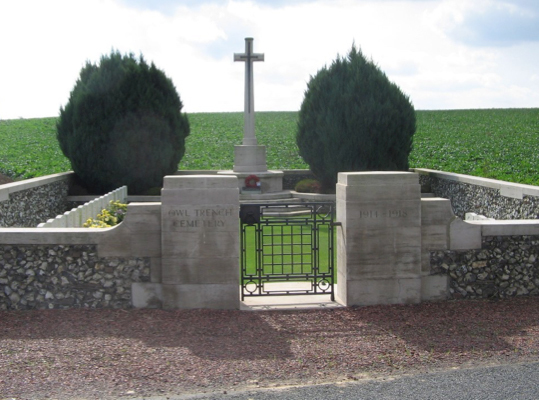 Owl Trench Cemetery near Hebuterne, a mass grave for the Bradford Pals who died on 27 February 1917. There are three names on each headstone. LCpl Ernest Nettleton is buried here. This original grave marker is unique. 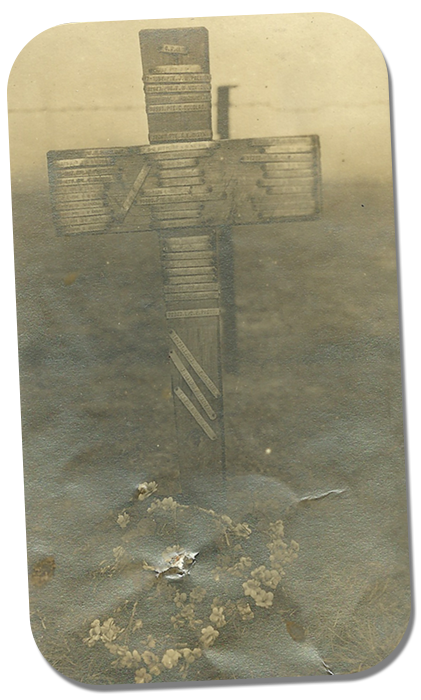 The one cross has 63 names pinned to it for the men buried in Owl Trench. Arriving at Pont RÈmy railway station on March 9th they trained for trench warfare in preparation for the mighty Battle of the Somme. ‘Going over the top’ on 1 July 1916 was the first taste of front line battle for these Pals’ Battalions. Casualty rates were tragically high especially amongst the young officers who led their men with such zeal. It is estimated that out of a fighting strength of 24 officers in the 1st Bradford Pals 12 were to die and 10 were wounded. It is estimated that from 675 Other Ranks, 69 died, 111 declared missing and 313 wounded. From a similar fighting strength in the 2nd Pals, 16 officers and 400 Ors became casualties, of which about 1 in 4 would die. Once the full horror became apparent, the atmosphere in Bradford was one of shock, disbelief and almost overwhelming sorrow. Even those who had escaped personal bereavement could not fail to notice the drawn curtains in the front rooms of houses in every street. Such was the grief that some wondered if the mourning would last forever. For the survivors the war did not end there. The remnants of the Bradford Pals were withdrawn to the Neuve Chapelle area and then, in the winter of 1916 – 1917, they returned to the village of HÈbuterne, about one mile from their 1 July jumping off point. On 27 February they were ordered to ‘probe’ the German lines at Rossignol Wood. Before dawn on 27 February 1917 men crossed the quiet fields in darkness. Battalion HQ waited for news: when it came, it was all very bad. Poor intelligence had missed spotting a German gun emplacement in Rossignol Wood. When the Bradford men emerged from their trenches they were cut down. Casualties: two officers and 64 ORs killed, 10 ORs died of wounds, 2 officers and 83 ORs wounded, 65 missing: Total 222. Throughout 1917 casualty rates continued to rise. At Oppy-Gavrelle in June, 11 officers and 303 other ranks were lost (wounded, missing or died) in one day. 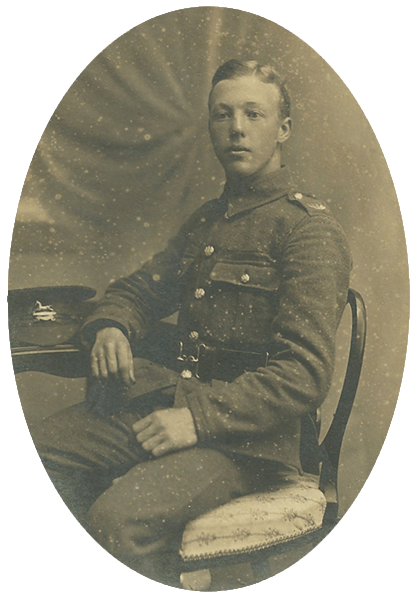 Throughout summer and autumn men were lost in patrolling and trench raids at Arleux and MÈricourt. On 28 February 1918 the War Office disbanded the 16th and 18th Battalions, West Yorkshire Regiment. The last entries in the War Diaries read: “The total strength of the battalion (583 ORs) are posted to 3rd Entrenching Battalion” and “This reduced the strength of the Battalion to NIL”. From the ‘Entrenching’ pool of troops many of the Bradford Pals transferred to the amalgamated Leeds Pals and to the Leeds Rifles whilst some men filtered into other units within the West Yorkshire Regiment. The remains of a German post in Rossignol Wood. 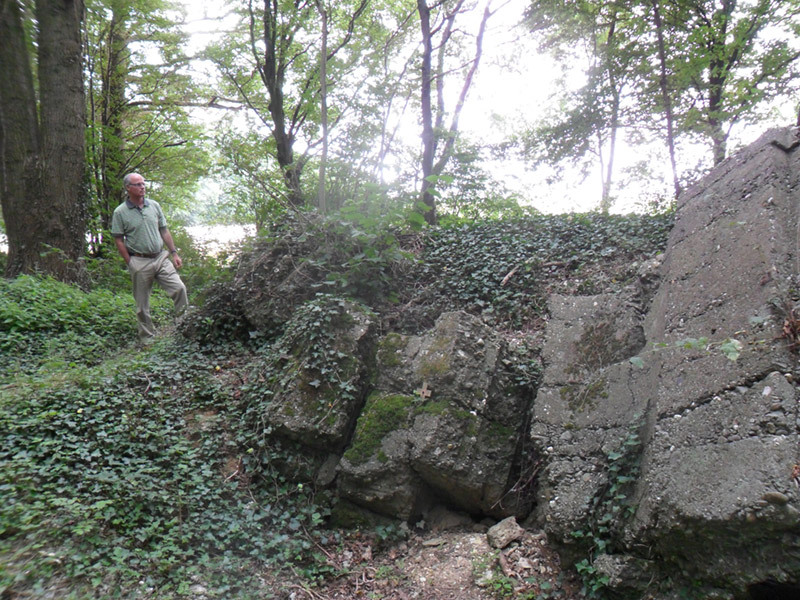 Machine guns positioned here inflicted terrible casualties on the Bradford Pals on 27 February 1917. 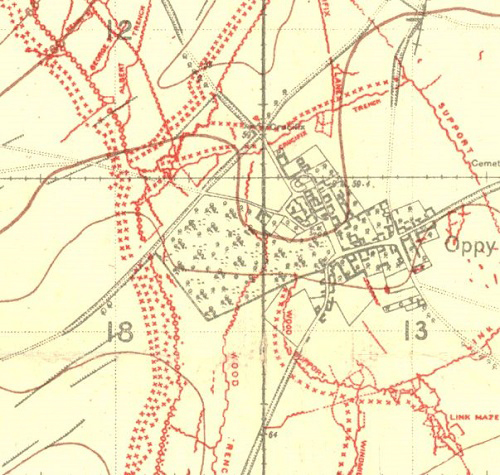 A British Army map of Oppy village (May 1917) showing the criss-crosses of barbed wire barricades which the Bradford Pals has to penetrate in order to reach the village from the western side.